Please note that the minimum age for eLearning is 10. This is a PADI policy and is due to internet privacy regulations and requirements. Keep in mind that eLearning registration is a credit card process, so those underage will require parental permission and guidance to get started. Students (15 years of age and over) who complete the course will become PADI Open Water Divers, those under 15 will become Junior Open Water Divers. I'VE COMPLETED MY PADI OPEN WATER ELEARNING - NOW WHAT? You have already completed your five academic sessions during your PADI E-LEARNING which includes four quizzes and one final exam, this will give you the knowledge you need for entry level scuba diving. Now comes the fun part - getting into the water, it's as easy as one...two...three! DAY ONE - Pool session (confined water) – This will give you the skills required for visiting the underwater world. You get hands on experience with the equipment and techniques ready for those open water dives. 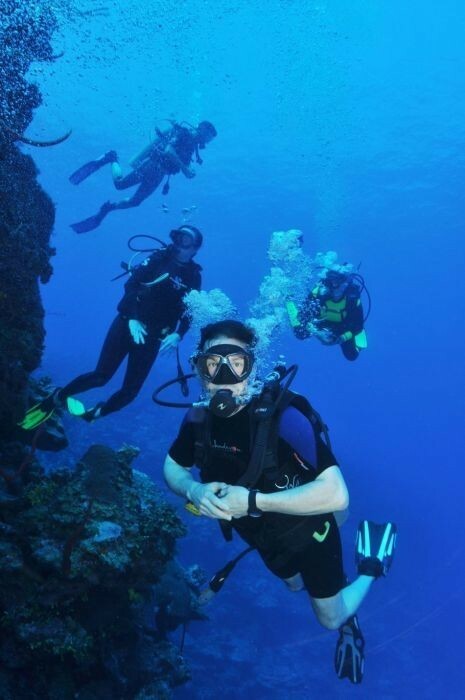 DAY TWO - 2 x Open Water Dives – You will complete two shallow dives throughout the course of the day. These dives will re-enforce your skills learnt in the pool and apply the knowledge of your classroom/academic sessions. DAY THREE - 2 x Open Water Dives - You will complete your remaining two open water dives and then you will be certified by your instructor upon completion of all these sessions and given your temporary PADI open water certification card. You will then receive in the mail your own personal Certification Card with your photo and identification number, this can then be used any where in the world! !